It’s time to kick off the new year with some modern resume tips! With the digital age, the art of writing a simple resume has dramatically changed. There was a point in time where hiring managers would have to sit and sort through resumes to determine the best candidates for the role. This would work as an advantage for many job seekers as their writing was immediately in the hands of human eyes. Now, to cut time and effort, companies have implemented applicant tracking systems (ATS) to screen candidates quickly and efficiently. Many companies, including LinkedIn, have announced they will be implementing applicant tracking systems into their candidate sourcing efforts. Prepared by our Certified Professional Resume Writers, here is a list of our top ten 10 modern resume tips for writing a great contemporary resume in 2019 to beat applicant tracking systems and BOOST your interview chances. Hiring managers don’t want to read through an extensive, lengthy resume. A complex resume can come off to a hiring manager as unappealing, boring, and hard to read. When the first initial reaction for hiring managers is a negative one, chances are that the applicant will be eliminated as a potential hire. Take the time to write out all of your experience. Then, carefully narrow your information down to one page of quality, relevant information. This allows hiring managers to key in and focus on your keywords immediately upon obtaining your document. While the idea of a heavily stylized resume format is enticing, we know that these graphics-driven, cool resume formats and templates do not perform well in applicant tracking systems. These computer programs are designed to pull information on your background and career into specific fields in a specific order. Don’t risk losing out on a position because your work resume is not parsing properly into an ATS. It is a general rule to use a font size between 10-12 when writing a simple resume for two reasons. First, too small of a font can affect your resume’s readability, creating difficulty for hiring managers to look through your information. Secondly, too large of a font could be perceived as a lack of content and information to share with the employer. Avoid using fonts such as Comic Sans, Lucida Console, Brush Script, and any font that looks too complex or widely spaced out on paper. Studies show that some of the best fonts to use when writing a simple resume are Book Antiqua, Calibri, and Garamond. Applicant tracking systems are computers that are designed to read documents in a specific order. It is critical to format your header in a clear manner so as not to confuse the ATS. This can result in your resume being filtered out immediately. Make sure your header lists your first and last name, followed by your address (city and state minimum), phone number, and professional email address. We are often asked by clients whether or not to include entire addresses (street names, unit numbers, etc.). The answer is yes. ATS is designed to geo-filter resumes by location. Having a complete resume allows ATS to see where you are located, and whether the position is a fit for you or not. After all, there is very little point in interviewing for a position that is a 4-hour commute from your home, especially if you’re not looking to commute! One of the most successful resume tips to maximize performance against the ATS is the professional summary. Lead in the resume with two to three sentences describing yourself as a professional and include as many pertinent keywords from the job description as possible. This signals to the ATS that you possess all the skills necessary for the job. A mistake that we see often is the utilization of responsibilities to fill out the content of the resume. Hiring managers are more concerned with what you can help their organization achieve and are looking for people who can add a track record of success. It’s always best to use sentences that outline your achievements. This is one of the best modern resume tips you can find. On a resume constructed of the written word, the inclusion of numbers immediately draws the attention of hiring managers, which is why it is a good idea to include them. Adding numbers to your resume has a dynamic effect on the overall structure and impact of your accomplishments. Quantifying statements will help employers visualize the overall impact you’ve had on the position. It is common to find that not all positions involve hard metrics. However, it is still feasible to add numbers to any position listed on a resume. Compare “provided customer service to clients” to “engaged with 15-20 clients per day to find quick resolutions in order to effectively solve complex situations”. Same task, same number of clients, different structure. Keep in mind that an employer would be more inclined to interview the job seeker who was able to handle 15-20 clients a day than a candidate who’s missing quantifiable measurements on their resume. Number 8 on our modern resume tips is the word limit. While it can seem like a good idea to fill a resume with as many words as possible, stick to a word limit of roughly 400 words per page. This has been found to be an ideal balance of keyword density and aesthetic appeal. It provides you with plenty of space to be detailed about your experience and accomplishments without blowing out the word count and presenting the hiring manager with a resume that is overly dense and unattractive. When it comes to formatting your resume, a simple resume writing tip is to use bullet points instead of paragraphs to break up the text. Use bullet points to highlight one accomplishment at a time instead of explaining your career in paragraph form. This makes things easier to read to hiring managers. 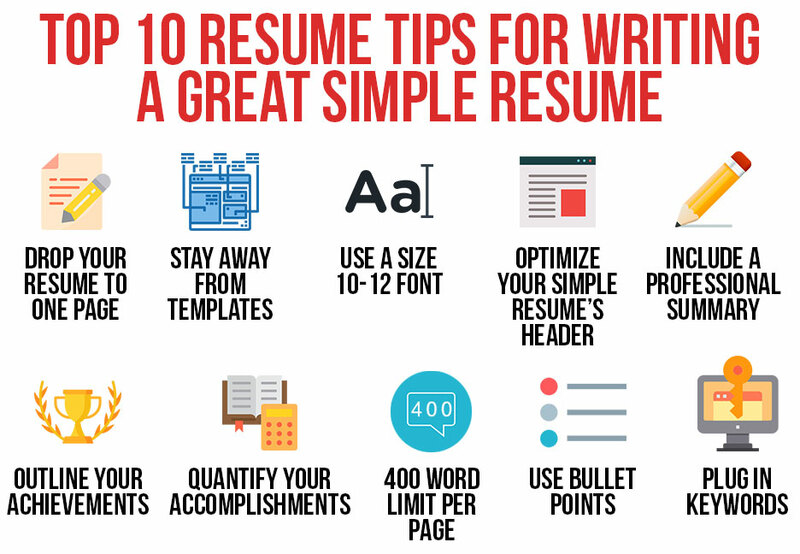 Bullet points are essential to simplifying a resume. In retrospect, they have been proven to be successful in making your accomplishments stand out within seconds. Creating a bulleted list of your accomplishments helps to mitigate clutter within your simple resume. Bullet points allow the hiring manager to focus on areas of the resume that you want to draw attention to. Last but not least, to round out our modern resume tips, plug in keywords. Within job postings, the position’s job description always will contain keywords and phrases that the hiring manager is looking for in a potential candidate. Therefore, to better your chances at landing an interview, study this information and write down the main keywords. Be sure to add keywords into your resume to pass ATS and catch the eyes of hiring managers. Though it is important to use keywords throughout your resume, be careful to not over-saturate your resume with these keywords. Hiring managers will surely catch on to this. Implement your keywords where you see fit so your simple resume flows smoothly. The best resume writing examples find unique ways to impress employers. Too often, a resume lacks substance and detail to make it stand out as a quality resume. Utilizing these modern resume tips will be surely get you an interview. Get all of your resume needs to successfully land a job interview at a low cost today!